So great to see Cory Monteith reunited with girlfriend Lea Michele! The on-screen and off-screen couple jetted off to Canada on Friday following Monteith's stint in rehab. 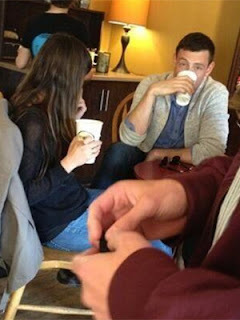 A fan snapped a picture of the "Glee" lovebirds grabbing a cup of coffee with Monteith's mother, Ann. The trio was also spotted dining at the wharf in Victoria, British Columbia. In late March, Monteith, 30, voluntarily checked into rehab for substance abuse at a facility on the Caribbean island of Antigua. "[Cory] is doing great," a source tells omg!. "Lea and his family were so supportive. Knowing he was coming back to that support system was huge." Michele, 26, publicly and privately stood by her man during his difficult time, and judging by her tweets, she couldn't be happier that they are finally reunited. Once the couple comes back to L.A., Monteith will have quite the nice place to shack up in with his ladylove. Michele recently teamed up with style website Domaine to give her home a "cozy" new makeover.